Rachel Atkins’ cabaret-style play is based on the saga of a group of Seattleites who tried to open a theater school in a French château. It must have been quite the adventure. In early 2001, a group of stage artists chucked their Seattle lives to occupy a château in France, where they planned to open a school and theater. Hopes were high, finances precarious, foreign-language skills spotty. And within months, clobbered by freak storms, cash shortfalls and local suspicions of cult activity, they declared defeat. By Rachel Atkins. Through Saturday, March 7, at West of Lenin, 203 N. 36th St., Seattle; $20-$25 (the1448projects.org). All this really did happen to participants in the Ardeo Theatre Project, among them playwright Rachel Atkins. But Atkins’ rambling new play about the escapade, “Voyage for Madmen,” also takes on more than it can handle. The loosely adapted Ardeo saga in “Voyage for Madmen” is framed as a Brechtian cabaret. Though loud and boisterous, it fails to transmit the excitement of such a romantic (and impractical) venture. In this telling there’s no dramatic arc: the project looks doomed from the jump. 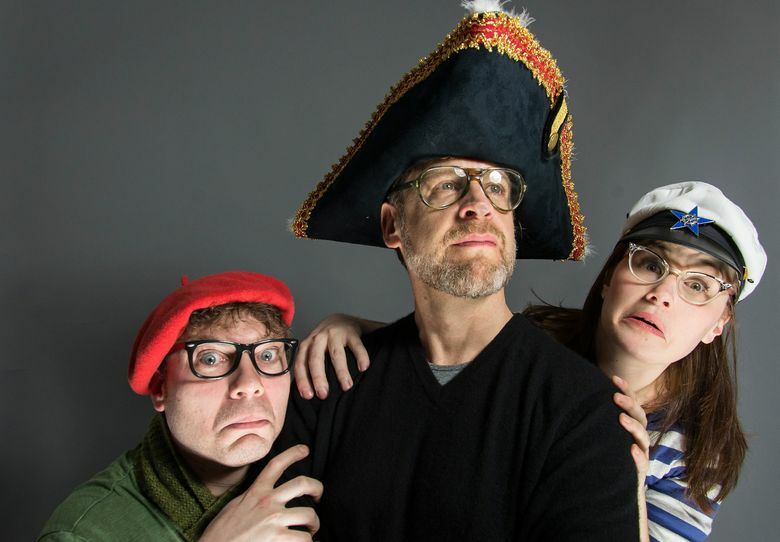 The hastily assembled group heads off on a whim, and spends its days in the crumbling château griping, goofing, telling pirate jokes (enough with the “arrgh” already) and (loosely) rehearsing. Making theater about making theater has inherent pitfalls, which this piece does not sidestep. One is preciousness, another self-indulgence. Without really articulating the passionate ideals they supposedly share, the Ardeo characters seem simply naive and flippant. The lofty parallels drawn between their folly and “Frankenstein,” Shakespeare’s “The Tempest” and the fascinating, quixotic real-life voyage of British boat racer Donald Crowhurst are obvious and repetitive. As for the acting, a cabaret motif isn’t a license for excessive mugging. (Erin Stewart is the worst offender.) Though how to keep a straight face, in the many recurring scenes of the project founder (played shakily by John Bianchi) declaring how bad things are going, and hitting up his compadres for money? There’s so much clutter and clatter in “Voyage for Madmen.” Could there be another way to involve us in the Ardeo journey, and make a case for its significance?